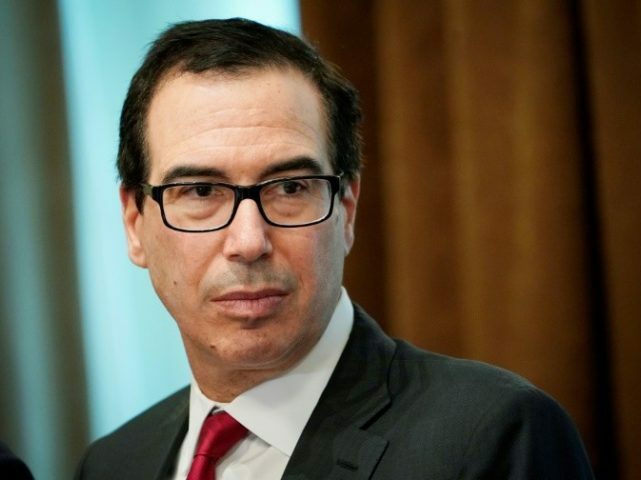 Treasury Secretary Steven Mnuchin has proposed lifting all or some of the tariffs on China, the Wall Street Journal reported on Thursday. Treasury officials have advocated lifting tariffs on Chinese imports to “give Beijing a reason to make deeper concessions in ongoing trade talks between the two countries,” the Wall Street Journal reported, citing people close to the matter. That would be a sharp reversal of the administration’s earlier stance. The tariffs were put on Chinese goods in the first place to give Bejing an incentive to make concessions to U.S. demands that it give up its predatory mercantilist economic strategy. Many inside the administration, including officials from the Treasury Department and inside the White House, opposed the tariffs before the decision was made to impose them. U.S. Trade Representative Robert Lighthizer is opposed to lifting or easing the tariffs, arguing the Chinese would consider such a move as a sign of weakness, according to the Wall Street Journal. Earlier this week, Senator Charles Grassley told reporters that while China had agreed to buy more energy and agricultural products, Lighthizer had told him that there had been essentially no progress on the “structural issues” at the core of the trade dispute.